See in Glossary element can be placed inside. If the parent of a Rect Transform is also a Rect Transform, the child Rect Transform can also specify how it should be positioned and sized relative to the parent rectangle. Pos (X, Y, Z) Position of the rectangle’s pivot point relative to the anchors. Width/Height Width and height of the rectangle. Left, Top, Right, Bottom Positions of the rectangle’s edges relative to their anchors. This can be thought of as padding inside the rectangle defined by the anchors. Shown in place of Pos and Width/Height when the anchors are separated (see below). See in Glossary The anchor points for the lower left corner and the upper right corner of the rectangle. Min The anchor point for the lower left corner of the rectangle defined as a fraction of the size of the parent rectangle. 0,0 corresponds to anchoring to the lower left corner of the parent, while 1,1 corresponds to anchoring to the upper right corner of the parent. Max The anchor point for the upper right corner of the rectangle defined as a fraction of the size of the parent rectangle. 0,0 corresponds to anchoring to the lower left corner of the parent, while 1,1 corresponds to anchoring to the upper right corner of the parent. Pivot Location of the pivot point around which the rectangle rotates, defined as a fraction of the size of the rectangle itself. 0,0 corresponds to the lower left corner while 1,1 corresponds to the upper right corner. Rotation Angle of rotation (in degrees) of the object around its pivot point along the X, Y and Z axis. Scale Scale factor applied to the object in the X, Y and Z dimensions. 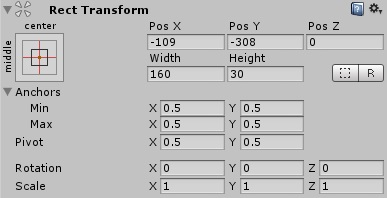 Note that some RectTransform calculations are performed at the end of a frame, just before calculating UI vertices, in order to ensure that they are up to date with all the latest changes performed throughout the frame. This means that they haven’t yet been calculated for the first time in the Start callback and first Update callback. You can work around this by creating a Start() callback and adding Canvas.ForceUpdateCanvases() method to it. This will force Canvas to be updated not at the end of the frame, but when that method is called. See the Basic Layout page for a full introduction and overview of how to use the Rect Transform.